As a homeschool mom, I don’t really have the pressure of getting everyone out the door by a certain time, but I do still have to make my children breakfast! While some days are obviously easier than others and my kids choose to just eat some milky cereal. Most of the time they don’t want to be eating cereal every day! 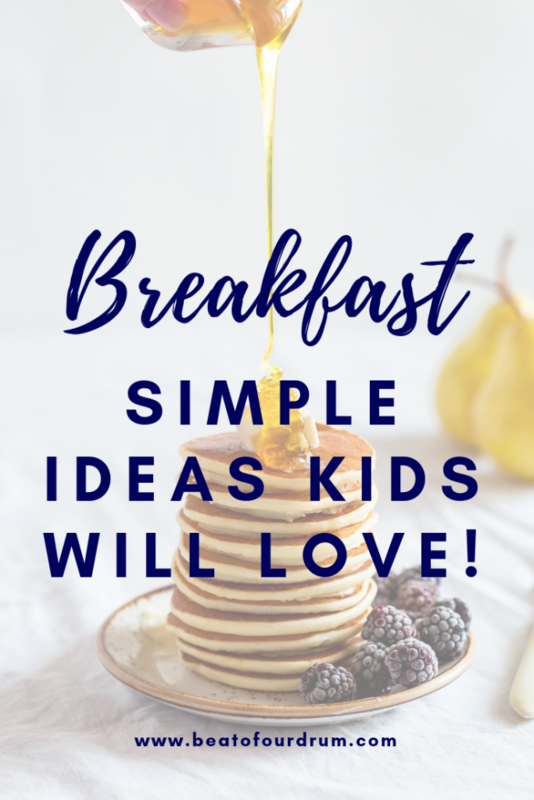 Here are my go-to super simple breakfast ideas that my children absolutely love! Toast and cut up fruit – While lots of people think of toast as a breakfast sometimes we forget that pairing it with something else can make it that much better. I personally like to add some things on top of my toast but my kids find that too exciting and like some cut fruit in a bowl beside. Waffles and yogurt – Again, these things are separate items just eaten at the same time. We usually buy the kind of waffles that you just pop in the toaster. The kids really like the cinnamon flavoured ones. Yogurt and fruit – My kids don’t like the kind of yogurt with the fruit chunks in them so I tend to get the super plain yogurt and then just give them fruit on the side. Eggs and toast – This is super simple but is nice when the kids want something that isn’t cold. Plus, if I’m feeling particularly fancy I can do a chick in the nest or whatever you call them when you put the eggs in the middle of the toast. Sausage cut up with toast – My kids aren’t really fans of huge breakfasts so I tend to do little bits and pieces of what other people commonly eat for their breakfasts. Also, I find if I cut up the toast into quarters my daughter likes it a lot more. Meat and cheese sandwich – While this wouldn’t seem like the normal breakfast food to you my son absolutely loves a good meat and cheese sandwich and he isn’t picky about what time he’s eating it! Kids are a bit strange that way! 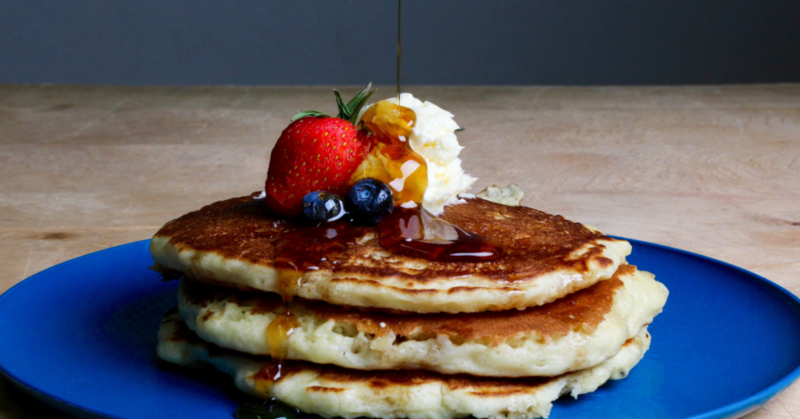 Pancakes and bacon – Very traditional, yet very yummy breakfast. One tip I have is that if you want thinner pancakes, we like those, use a hand mixer on high to mix your pancake batter! Peanut butter and honey wrap with a banana – These are super easy to take with us when we have an early morning and we are needing to eat breakfast in the car. Honestly, though we like these any time! Smoothie – This is especially popular in the summertime. I would highly recommend getting some powdered peanut butter and dates to through in there, so yummy! Our go-to smoothie is banana, strawberries, almond milk, powder peanut butter, and dates, SO GOOD! Cream of wheat – My son really isn’t a fan of this one but my daughter and I eat cream of wheat all the time! We get the big boxes that you make in a pot but you can also get the single serving packs, we sometimes get those when we go camping. I am not a huge fan of breakfast. In fact, I would rather not bother eating it but my 5 year old loves to eat breakfast. Most mornings he has cereal but our 3 yr old is so picky I have to get creative with her. Of late, we have been having toast. Simple for me to make and both kids (and mom) eat it. We are working getting our teen up for breakfast. He has been sleeping in. Yes, breakfast can look so different for everyone. My one suggestion for picky eaters would be to cut everything into little pieces, somehow this makes it look more appetizing I guess? our simplest breakfast is cold cereal with milk, then oatmeal, then a bagel with cream cheese. We also quite enjoy out cold cereal and milk! I don’t have a gall bladder and I have hashimoto’s and a blood sugar issue so breakfast is really important yet hard for me. My nine-year-old has gotten very good at fried eggs, eggs in a basket, scrambled eggs and oatmeal. When I make it to the kitchen, I love to have a good coconut oil fried egg with a side of squash or zucchini. Oh yes adding some veg into breakfast can be very good, although I don’t think that my children would like it very much. Peanut butter and honey wrap is one i don’t think about but my children would probably enjoy. We normally cook a full breakfast because my son does best with lots of protein but those would be great on mornings we are in a hurry and the PB would give him that protein that he needs. Thanks for the ideas. Thank you very much for taking the time to read this! I am so glad that you were able to get an idea! I think the idea of a full breakfast is lovely but none of us ever feel up for eating a lot of food first thing, we are very much the “second breakfast” kind of homeschoolers. Or even better described as, if there’s learning being done there’s also food being eaten! We tend to grab our own quick breakfasts during the week but I usually make something a little more traditional on Saturdays. A PB and honey wrap sounds like a great idea for one of our grab and go days! I feel like grab and go will become more and more our norm as my children get older! Cream cheese in the place of the peanut butter also work if you’re going somewhere that’s peanut free.